In June 1965, a gold bust-length portrait of the emperor Septimius Severus in armor came to light by chance at the site of the Roman town of Plotinopolis in Thrace, a former Greek settlement rededicated by Trajan in honor of his wife, Plotina. The bust, fashioned by hammering and engraving 23-karat sheet gold, weighs 980g (3 Roman pounds) and is 25cm high. The portrait is truly a masterpiece of the metalworker’s art and is, in my judgment, the finest extant image of a Roman emperor in precious metal. It is regrettable that, more than a half-century after the discovery of this Severan bust housed in the small regional archaeological museum in Komotini, Greece, it is still virtually unknown. But the Plotinopolis portrait has now received the meticulously documented and lavishly illustrated monograph it has long deserved, and for that we must be grateful to the authors and the publisher. The quality and rarity of the Plotinopolis bust on their own justify a monographic publication, but Pury-Gysell has used the Severan portrait as the springboard for a very valuable general discussion of Roman imperial portraits in gold and silver, with chapters on gold as a symbol of power, the ancient texts mentioning gold images of emperors, and the role of portrait busts in the imperial cult and as key elements of military standards. Indeed, all but one of the extant portraits of an emperor in either gold or silver were found in the provinces, the exception being the silver bust of Galba from Herculaneum, which is also the earliest example—all the more remarkable because of the emperor’s short-lived (seven-month) reign ending in assassination and decapitation. Part II of the Librum monograph is a catalogue of every known Roman imperial portrait in gold or silver with multiple color photos of each piece. These include well-known images, such as the gold bust of Marcus Aurelius from Avenches in Switzerland and the silver bust of Lucius Verus from Marengo in Piedmont at an Alpine crossing (both, like the Galba and Septimius Severus busts, portraying the emperor in cuirass), as well as many little-known examples, numbering 13 in all. Most date from the Late Empire and the identifications of several are very tenuous. Almost all are singular finds or without any provenance, but the Marengo bust was part of a large silver treasure uncovered in 1928—the highlight of the archaeological collection of Turin’s Museo di Antichità. Of those precious-metal portraits that consist of the head alone (as opposed to a bust) the most interesting has been known since at least 1010. This is the head of the gold-and-bejeweled Romanesque reliquary of Sainte Foye (Saint Faith) at Conques, France, here identified as most likely a portrait of Valentinian I, although the head has also been considered a reused Roman parade helmet with a generic face and a portrait of Charlemagne—all curious choices for the image of a girl-martyr that underscore the rarity of ancient precious-metal spolia even a thousand years ago. 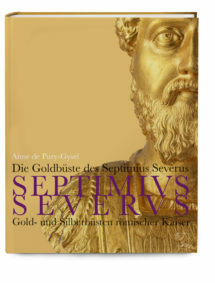 In sum, Die Goldbüste des Septimius Severus is a most welcome publication that should inspire further studies of the phenomenon of depicting emperors in gold or silver (no comparable portraits of empresses survive, which may be an additional explanation for the reuse of a male head for the Sainte Foye reliquary). Anne de Pury-Gysel’s new book merits a place in every research library on Roman portraiture. Order now and click here!